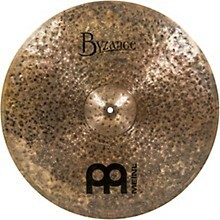 Meinl Byzance Jazz Big Apple Dark Ride Cymbal 24 in. 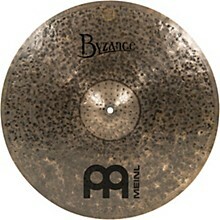 The Meinl Big Apple Dark Ride is a specially developed ride which meets the requirements of old school jazz and delivers a rich, dark timbre. Earthy lows and an immediate dark wash flow along with its delicate stick definition. A small bell and distinctive large bow offers a full-bodied sound. The hand-hammered and lathed surfaces with warm sounds and selection of models may be rooted in tradition, but Meinl Byzance cymbals are the ultimate choice when it comes to modern versatility. Every Byzance model is hand hammered into shape by cymbal artisans in Turkey, giving each cymbal its own unique and colorful voice.